Have you been busy with family, work and other crazy life demands? I have been nearly "under water" it seems. But don't think for a minute that I haven't been busy crocheting. Not only is crochet part of my "work", but it is something of a priority around here. I must play with yarn!! You might just understand. As of today, I've got 4 designs that are completed and even photographed and 3 more on my hook but not a single pattern written for any of them. Why is that? Can you say..."Squirrel!"? I've got it bad. Distraction. My archnemesis. And to make matters worse, look what just showed up in the mail. 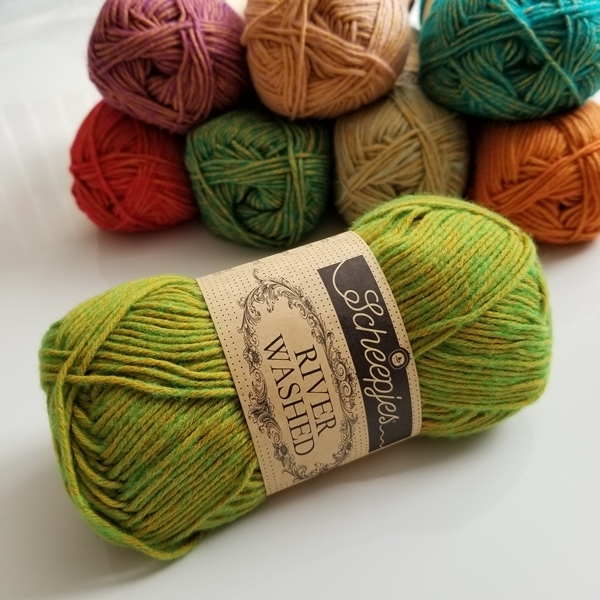 Scheepjes River Washed has 8 new glorious colors. These scrumptious colors have a yellow core and various colored "fluff" which gives it a uniquely washed appearance. I think it's a very contemporary look. And I also think it goes brilliantly with Stone Washed*. 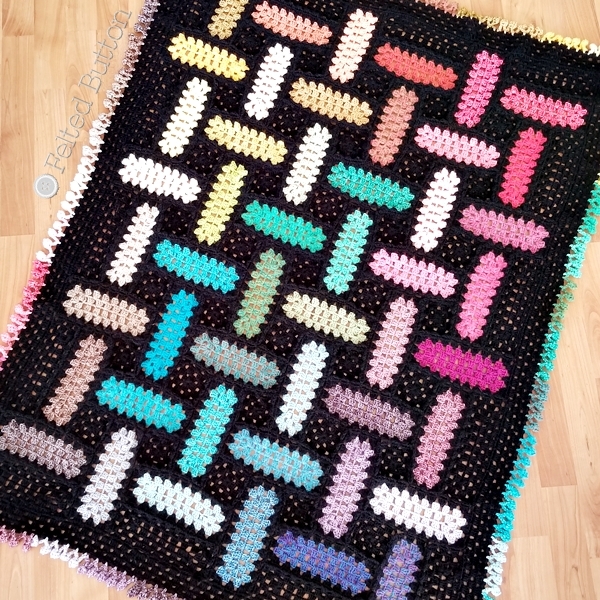 In fact you might remember my free crochet pattern for the Warp and Weft Blanket made with Stone Washed and River Washed together (from the cutie pie colour pack here*). Let me show you a few closer pics of this soft yarn. Can you see the difference between the inner thread and the outer net? This yarn is 78% Cotton/22% Acrylic and considered a Sport weight yarn. I used a 4mm hook with my blanket above and got a lovely drape. Each 50g ball is 130m/142yds, so a good size, methinks. 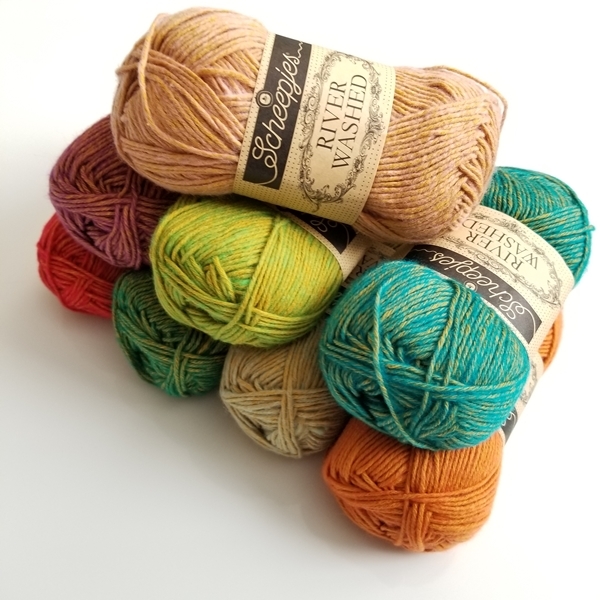 Now let's talk color, because that is what's so brilliant about all of the River Washed yarn. Would you look at this beauty? Now let me turn them around and show you some more magic. Do you ever get frustrated trying to find that center tail in the ball? All River Washed and Stone Washed yarns have the fabulous Easy Start tabs so you can get crocheting right away with no "yarn barf". Easy Start = Easy Peasy. Speaking of Easy Start--that is precisely my problem! It's easy to start all that happy crocheting but difficult to finish with pattern writing. Blasted! I'd better get on that before I pull those tabs!! 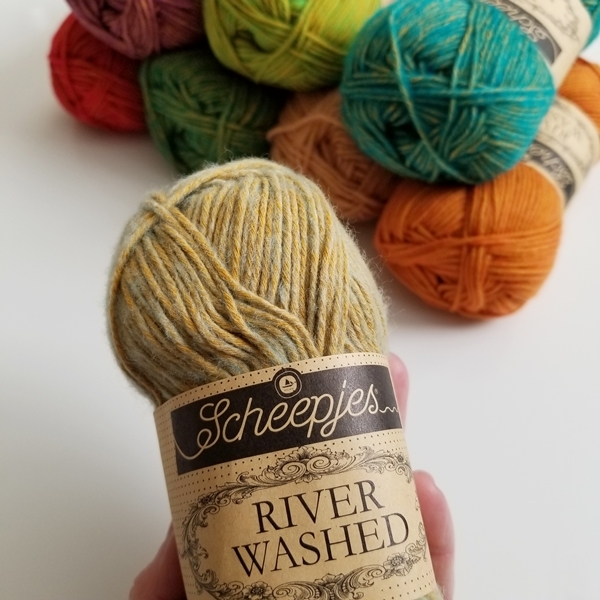 But this Scheepjes River Washed makes me excited to get started because I already have an exciting idea for these babies! 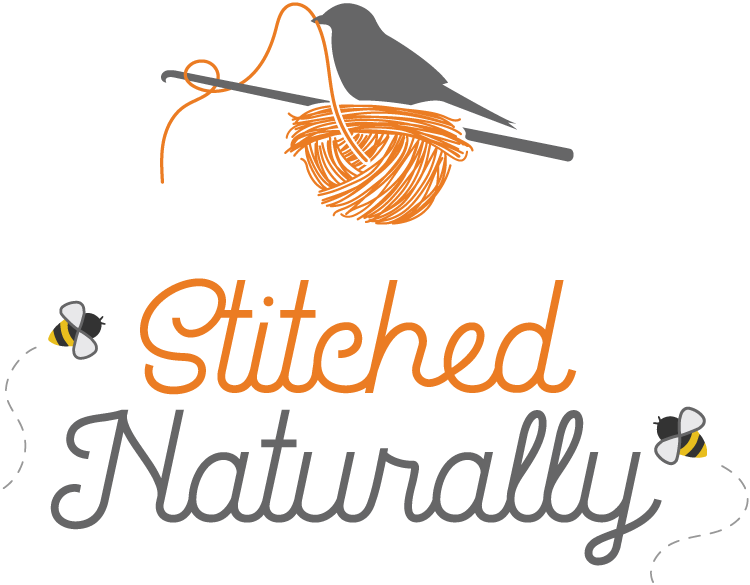 If you want to get your hooks in some, if you use this link* it will pay me a small commission that helps me keep blogging and providing free patterns and such. Thanks! 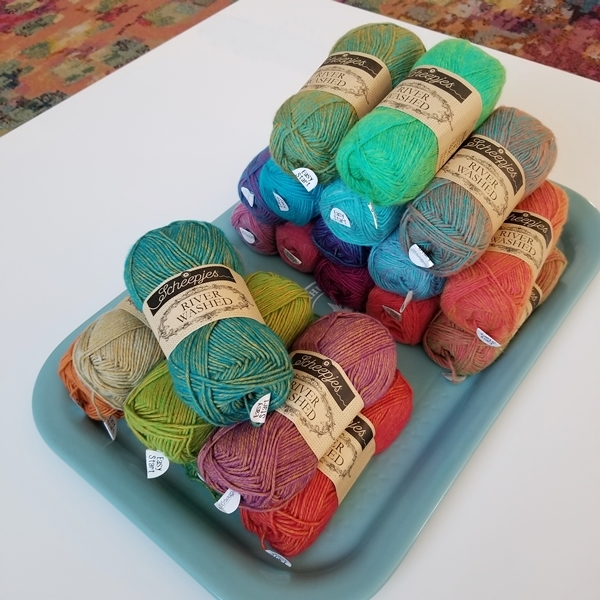 Oh, and lest I forget, if you prefer an aran/worsted yarn, all of these glorious colors come in an XL version which you can find here*. 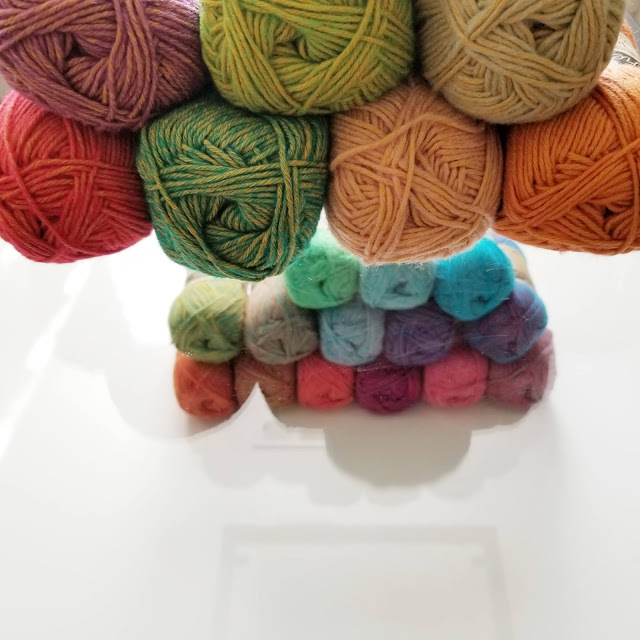 Here's to a happy day full of color, yarn, crochet, family and friends! I'll stop by and share more...as....soon....as....I....can....squirrel! | On the Board | -- Your potential is endless. Go do what you were created to do. 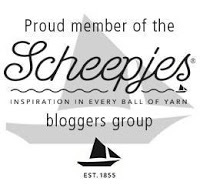 *This post contains affiliate links which if used by you do not cost you any more but provide me a small commission that allows me to continue providing free patterns and blogging. Thanks a bundle!